65 total news articles in this section, 10 per page. Seibertron.com members Pretender Skywarp and City Commander report finding Reveal the Shield Wave 1, featuring Turbo Tracks, Mindset, Fallback, and Special Ops Jazz, at Smyth's in the UK, for the low price of £7.49 each. Pretender Skywarp also reports these figures (as seen above) are in full EU packaging, so expect to see more Reveal the Shield figures in the UK and Europe soon! 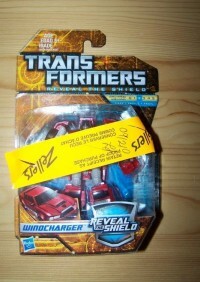 Cybertron.ca member Pascal reports finding both Windcharger and Chopsaw at Zellers in Quebec. They should be showing up within the US and the rest of Canada within a few weeks, so keep your eyes peeled, especially with after Christmas restocking. In the meantime, check out Windcharger's bio. Don't forget to post your sightings to our forum and database! We previously reported that select Walmarts now carry Wave 1 of Reveal the Shield figures, consisting of Mindset, Fallback, Turbo Tracks and Special Operations Jazz. Now the same wave has started showing up in Kmart and Walgreens throughout the US. Don't forget to post your sightings in our Sightings section and our Sightings forum. Though the figures are not yet registering on Kmart and Walgreeens' computers, they are on the shelves and available to be bought. PCC Grimstone and Steamhammer out at retail! 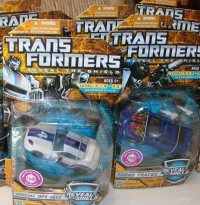 Seibertron member El Duque has found these two Power Combiner 5-Pack sets at his local Wal-Mart in Oklahoma. Several of your members have reported sightings about them, just check out the thread by clicking here. Tesco: Any 2 Scouts 10 pounds! We have been informed by "shawn" via e-mail that it looks as if Tesco is having some sort of sale on Transformers Scout figures. Tesco is of course a UK chain of stores so this is of no interest for non-UK readers. The sale is any 2 Scout Class figures for 10 pounds, which saves you 5.97 pounds when compared to the standard price of 7.97 pounds each. This might not be nation wide so please report if the sale is near you by visiting the UK sightings thread. 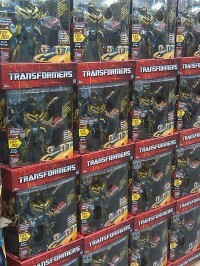 The Costco exclusive BATTLE OPS BUMBLEBEE Value Pack with Legends Class MUDFLAP and Premium BUMBLEBEE has been sighted at several Costco locations around the Chicagoland area. This exclusive retails for $41.99 plus tax. Please make sure you stop by our Sightings forum to share your sightings with your fellow Seibertronians. Here are a few pictures of the ones at the Costco in Mt. Prospect, IL from earlier this afternoon. Feel -- and even hear -- the excitement with this awesome electronic BATTLE OPS BUMBLEBEE figure: you can unlock different phrases and sounds in both of his modes! 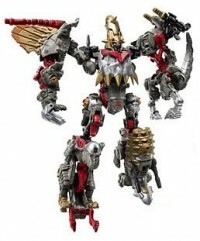 In robot mode, this powerful warrior features a flip down mask accessory to "protect" him and an arm that converts to a cannon accessory to attack his enemies. And those enemies will know they're in for serious combat when they see this figure's limited edition metallic finish, glowing eyes, chest and "weapons"! For "on-the-road" battle action, convert your figure into Camaro concept car mode and activate the fearsome flip out cannon accessories. From revving engine noises to vehicle battle noises and more, this figure's realistic sounds really put you in the "driver's seat" in every fight. And with his robot-to-vehicle BUMBLEBEE and MUDFLAP figures by his side, the action is bigger than ever! Value pack includes premium BUMBLEBEE and MUDFLAP Legends figures. Includes 2 "AA" batteries. Takara Transformers Alternity Thundercracker Released In Asia! Takara Transformers Alternity Thundercracker, a repaint version of Alternity Skywarp has been sighted in Singapore's hobby shops. Alternity Thundercracker is blue in colour and transforms to a Japanese super car - Mitsuoka Orochi. With this sighting, this toy is expected to ship pretty soon. If you have been holding off on paying full price on PowerCore Combiners, Seibertron.com member rcr02 has got some great news for you. According to rcr02, he was able to purchase Doubleclutch and The Rallybots for only $15.00 at a Walmart in Kansas City, MO. That's about 25% off the regular price. Now there is a VERY GOOD chance that these price reductions will be on a national scale. Why do we say this? Because Walmart.com also has the same price on PowerCore Combiner 5 packs. Taking Site to Store into consideration, that already makes this speculation true. So if you are still on the fence about PCC's, take these deals into consideration and let us know if you find any more of the next wave of PCC's in our Sightings Section. 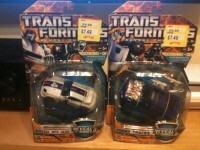 Hunt for the Decepticons Axor and Rescue Ratchet At Retail! TFW member JIMIVEGAS has located Wave 4 Hunt For The Decepticons Deluxes Axor and Rescue Ratchet at a Wal-Mart on Craig Road, in Las Vegas, Nevada. You can see JIMIVEGAS's sighting over at TFW. Got a sighting? Use our Sightings Database and Forum! Generations Dirge & Blurr Released In Hong Kong! HK-TF forum moderator "島耕作" has reported that the Transformers Generations Blurr as well as Dirge are available in Hong Kong. 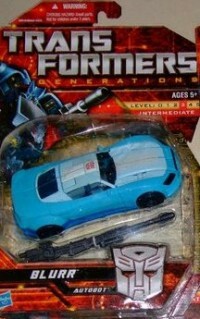 Generations Blurr is a remold of the Generations Drift that comes with new weapons and head sculpt. With this sightings, we hope these will be available in your local retail sooner rather than later. 4,939 pages were recently viewed by 711 unique visitors. This page was viewed 1 times on Monday, April 22nd 2019 9:55pm CDT. © 2019 Seibertron, Inc. DBA Seibertron.com. All Rights Reserved. Established June 2000. Seibertron.com is owned by Ryan Yzquierdo.